Please help us serve you best. Any comments on our service, repairs, instrument sales and advice are welcome. Send us your message and we'll post it here. (Remember to include your name and surname). I'd like to thank you for your expert service and quality repairs on my bouzouki. I was quite surprised to hear from you so early in the week for pick up of my bouzouki. For those keen Bouzouki players out there looking for professional service and alterations to their bouzouki's, John at Muso's Supply in Bankstown, is the man to see. His professional attitude, great craftsmanship and competitive pricing assured me that I had made the right decision going to John. He was able to do the work on my bouzouki in 3 days giving me plenty of time to adjust to the new action and extra 1/4 tone fret added before my Saturday gig. John was also able to assist me in trying other bouzouki's he had in his store at Bankstown to compare action and sound to mine and was also keen to assist me with a new bouzouki case if he could get his hands on one. I will be recommending John to friends and people who ask me for assistance in finding a bouzouki in Sydney. Once again thank you for your service. Thank you for servicing all my bouzoukia throughout the years. You have never let me down. You're always honest and reliable with the work you have done for me. Did you know you have been looking after my bouzoukia since I was 13?! I have known Yanni Bardas for over 10 years. In this time I have dealt with him both personally and professionally and have found him to be a very likable, helpful and knowledgable person. He is undoubtedly one of the finest musicians in our community and his ability to play BASS is second to none. He also writes both music and lyrics to his own quality original songs. Yanni is the owner of Muso's, a music shop in Bankstown and is both very helpful and competitive in the range of products he sells.Yanni is one of a kind and always a pleasure to deal with. I have known and been a client of Yannis Bardas for over 20 years now and I cannot speak highly enough of the service I have received and continue to receive. Nothing is too much for Yannis. At any given time, when I have any queries or problems he is quick to attend to. Over the years I have found Yannis to be a very helpful, friendly, honest, reliable, committed, knowledgeable and a customer-focused person. So to all you musicians out there looking for someone to attend to check out the latest models, get a good price on the latest gear or organize warranty repairs, or you need someone that believes that service is of paramount importance and is committed to delivering top professional service and is always prompt and friendly then don’t hesitate to visit Yannis at Muso’s Supply and Service at 344 Chapel Rd, Bankstown. I would like to thank Yannis Bardas for his support, friendship, advice, professional service, comprehensive musical knowledge and his commitment to supplying me with the best possible prices on products and instrument repairs he has done for me over the years. I highly recommend Yannis to all of my students and friends as he is the most trusted music supplier. You will have me as a customer for a long time to come. Once again thank you for the fantastic service over the years. John, I would like to say thank you for your professional service that you put into my repairs on my bouzoukia, baglama. If anyone out there wants their instrument repaired or wants to buy an instrument go and see John at Muso's Supply and Service, 344 Chapel Rd, Bankstown. John will look after you he's a good man, friendly and very helpful. I've known John for a while now and everytime I go to his shop he looks after me. Anyways thanks again John and keep up the good work. John - you are amazing! Many thanks. Thank you for all my questions you answered by phone and email. I was very excited when the postman arrived with my first Bouzouki. It was perfect. Exactly how you said. Also I just had my first lesson today and my teacher was impressed with the sound (well tuned by you). I wish to take this opportunity to thank you for your prompt and highly professional service. I am totally wrapped with my new 5A Red Terpsichore Bouzouki. I have only spoken to you 3 or 4 times on the phone, but just like your long time friend Michael N, I also feel as though I've known you for twenty odd years. I will have NO hesitation in recommending persons in the future to contact you, so you can assist them in fulfilling their musical needs. Thanks for your friendly, professional service and all your advice and help the other day, in helping me start the long road to learning the bouzouki. First of all I'd like to thank you for your absolutely excellent service & advice on purchasing my first mpouzouki last year. Everytime I come into your shop, your service & commitment to help are unrivaled. Your products are always of the highest quality and reasonable price. I have no hesitation in recommending you to my family & friends. I hope to see you soon for my next mpouzouki, I wouldn't think of going anywhere else, na sai kala! I write to thank you for the exceptional service you bestowed upon myself and my cousin during our recent visit to your shop. The bouzouki we finally purchased is a beautiful instrument and well priced. It will be played many hours both in my study and on stage. I shall visit again when I am in Sydney. I would like to take this opportunity to thank you for your impeccable service. The Tzoura was delivered as expected with the strings adjusted for a left hand player. The smile on my 8yr old son's face was unforgettable considering he has been practising on a Baglama for the past couple of months his transition to the Tzoura has been embraced with much enthusiasm and joy. I have purchased my first bouzouki from Yianni who has been an enormous help in getting me into the world of bouzouki playing. Being based in Darwin I have no bouzouki store or resource available locally. Yet with the level of service Yianni has provided it is as though I have a store right around the corner. The bouzouki plays well and sounds fantastic and exceeded all of my expectations. I received fast, personal and friendly service with exceptionally fair pricing. Yianni was always most obliging to assist in any matter with genuine consideration and professional knowledge. I will return to use Yianni in the future for any bouzouki advice, repairs or purchases. I gave the bouzouki to my husband last night. He absolutely loved it! Thanks for everything. Baglama arrived today and I am very happy with it! Thanks a lot. Recently you did repairs on my bouzouki, just wanted to say thanks for the professional , honest and prompt service. Happy to recommend your services. Just a quick note to say thank you for sending the bouzouki in good order and so quick. Thanks for looking after me and the great price you gave. I will recommend you to all my friends and family. I am writing this letter to you to thank you for your prompt help, service, advice and business that you gave me last Christmas ( 2011 ). I was late. You were busy. But that didn't stop you from helping me out when I needed it. You should know that I confirmed my order with you on the Sunday and I received the goods, in Brisbane, on the Wednesday - 2 DAYS BEFORE CHRISTMAS ! My son was really happy with the Hercules Bouzouki stand - it's a beauty ! He is YouTubing the Touberleki you sent so he can add another instrument to his repertoire. We both know and are confident that we can go to you if we need anything. I can't thank you enough. I was happy with the price. The goods were as ordered. Their condition was as in the store. The service was exceptional. You obviously care about business and the customer comes first. I really don't know what Gerry Harvey is complaining about ! As a follower of our glorious musical inheritance I have sent you a little information about what we are trying to achieve in Queensland. A happy, safe, prosperous and healthy 2012 to you and your family. Thank you very much for the instrument and the spare strings. I really appreciate your professional service. Great work. The bouzouki arrived today, only 3 days after you sent it, with all the promised accessories. It is a beautiful instrument, sounds great and is very easy to play. It is exactly what my son and I wanted. I’m writing this to thank you for your friendly advice and for repairing my 6-string bouzouki that I purchased in Greece. The bouzouki was unplayable with buzzing and dead notes. One phone call to John, problem fixed. My name is Peter Flaskas and I am a guitarist/musician who works predominantly around the Sunshine Coast / Brisbane / Gold Coast areas of South East Queensland. In the past 2 months I was asked by a friend to assist him in sourcing and buying a quality Greek Bouzouki. Knowing a lot of people in the industry who deal with a wide variety of instruments, I began my search – unfortunately here in Queensland there are few options for buying this type of instrument .... eventually my search led me to Sydney and John Bardas of “Muso’s Supply and Service” at Bankstown. In John I found a man who was prepared to educate me and share with me his knowledge of an instrument I knew little about. His patience was endless as was his knowledge of the instrument and understanding of my friends’ needs. He worked out an excellent financial arrangement for my friend and was extremely efficient in his packaging and transfer of the instrument to me interstate in Queensland. We ordered the instrument last Monday and it arrived at my house in Alexandra Headland on the Thursday of the same week (yesterday). Prior to sending the Bouzouki, John had made sure it was in immaculate condition (without a blemish or mark) and had set up the intonation and bridge so that by the time I was getting ready to play it last night, it was all setup harmonically perfect and ready to roll. John’s obviously a man of character and integrity and I’m looking forward to meeting him when I’m next in Sydney. Now that my friend is organised with his Bouzouki it’s time for me to look at another ... but this time for myself. I strongly recommend John as being the person to deal with for anyone looking for a quality Bouzouki .... I very much appreciate all he has done for me in this regard and look forward to my family and myself dealing with him over future years. Thanks John. Received bouzouki case this morning! I can't thank you enough Yianni, for your help with choosing my baglama and now helping me with the case. It's perfect and exactly what I was looking for. Thank you so much, again, for all your time and effort and dealing with all the finer details. I have been buying musical instruments for just under 30 years (mostly guitars), and I have to say that in that time John has been, by far, the best person to deal with in terms of buying an instrument. I bought a bouzouki and a baglamas off him and he patiently explained what to look for and how these instruments are made by hand. He also encouraged me to try instruments out of my price range to get a good overview of the differences between the various price ranges, which is something I really appreciate. If you look at the Matsikas website in Greece, you will be surprised at how competitive his prices are. Most importantly for me, is that John is direct and a straight shooter, which is becoming rare these days. I will be buying all my future guitars from him. Also, as a personal aside, if you have a Greek background and play the guitar, you have absolutely got to have a go at the bouzouki, when I started, I thought it might be of limited appeal, but as I started playing, I was completely captivated by it. Note, that if you do decide to buy a bouzouki, there are many poorly made ones out there and that is why you need to speak to someone with John's expertise so as to not buy an expensive lemon (or kolokithi), which is very easy to do. Just letting you know that the Bouzouki has arrived, THAT WAS FAST lol. Once again on behalf of myself and the Greek Pan Macedonian Association of Qld, thank you for your support, quick & reliable service. THANK YOU SO MUCH FOR THIS BEAUTIFUL BOUZOUKI. IT WAS SUCH A PLEASURE TO DEAL WITH JOHN. TO ALL WHO PLAY GUITAR HAVE A GO WITH A BOUZOUKI. ITS AMAZING. 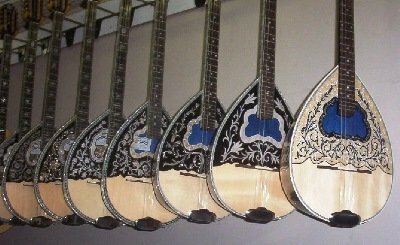 Thank you for the exceptional service in ordering my bouzouki parts (machine heads, kavalari etc.). The repairs have been made and the bouzouki sounds great. Looking forward to dealing with you again in the near future. Thank you so much for my bouzouki! It arrived today via Australia Post, very well packaged. It's a beautiful instrument and I'm over the moon with it. Thank you also for emailing the receipt, letting me know when it was posted and including the tracking number. I have just opened the Bouzouki from you and it is JUST SO PERFECT!! THANK YOU so much for making this such a simple and easy purchase for me and for all of your expert knowledge on the instrument too and also for being so generous for throwing in the postage and of course the extra strings! I just know he is going to LOVE it – you are a legend! Thanks again I am so happy and will recommend you to any potential future buyers of the bouzouki! My Bouzouki was badly damaged after a drunk patron at a gig bump it off its stand, smashing it into the ground. I took it to John at Muso’s, thinking the worst. He said it will take some work, but I can fix it – and he sure did! The bouzouki looks like it was not damaged at all, and most importantly, sounds great. Jose Hanham – Reggae Bouzouki player from Skankdeville.